Today, being the last working day of the year for me I am concentrating on the joys I have found in blogging. This post is dedicated to Buttercup. Buttercup was introduced to my blog by my friend Cindy (check out my daily diary page to see the ‘gift’ I have left there for Cindy). 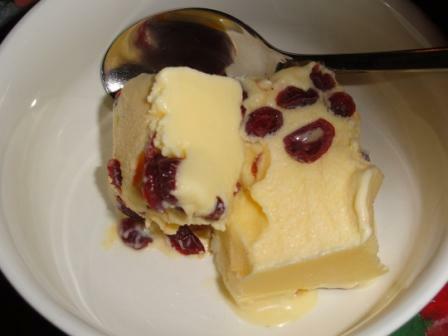 When I posted my ice cream recipe, Buttercup said she would much prefer Rum and Raisin. I however, cannot drink Rum – too much sugar in that, and I am not partial to raisins unless they are in my granola. So, I thought about what would be festive for Christmas and decided that cranberries were just the thing. Then, as I would need an alcohol to replace the Rum, I thought that the nice orange flavour of Cointreau would work perfectly. Wow! Now I don’t have to get the same old boring ice cream for Christmas. My family will really enjoy their Christmas dessert. Now this is what I call Ice Cream!